Are your seeds light or dark in color? Are they strong under pressure or become dust? These are some of the ways to know if your seed is healthy and worthy of being grown. 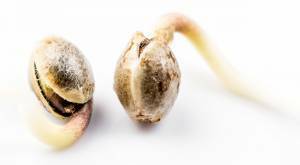 One of the keys to achieving healthy and potent cannabis plants begins with high-quality seeds. Of course, the nutrients, adequate watering, and quality of light all contribute to the final yield. However, the beginning of growth with superior genetics is the same, if not more important. By carefully purchasing high-quality cannabis seeds, you will get the exact genetics you are looking for. This will not only provide you with the desired profiles of cannabinoids and terpenes, but will also help you avoid quality issues and other problems. There are factors to look for when buying seeds, and some of the signs that mark it are not worth the time and effort required. High-quality seeds have certain aesthetic qualities that separate them from less healthy seeds. The most reliable seeds are brown, tan, or even black, while immature seeds have brighter colors such as white, yellow, and pale green. Some people even claim that the best seeds have dark spots or striped patterns and that on the surface they must have a bright glow when kept in the light, such as fresh wax. The immature and young seeds will have a green or white appearance. It is unlikely that this seed will germinate, and if they succeed, it will only take longer. It is worth getting fresh seeds of optimal age. You can identify the quality of cannabis seeds by their size and shape, especially when you can compare several seeds together. The largest seeds with the smallest round or dry form are of the best quality, while immature seeds are small and often irregularly shaped. The “floatation test” is a simple way to make sure that the seeds are viable or not. It is easy to dump the seed in distilled water to determine if it has enough weight to settle in an hour or two, and if this happens, the chances of germination are usually greater than those of the seed who floats. You must do this before planting the seeds, as water saturation can cause mold or rot, and will trigger the seed to start growing. If you know the age of the seed (at maturity), you will have a better idea of ​​the durability. Like all genetic materials, seeds break down over time, so freshly harvested seeds are often more durable than those that have been for months or even years. You must store the seeds in a dark and cool place (even in the freezer) so that it does not mold. You might also consider using silica gel beads to help remove water from the area where you store the seeds to help extend their shelf life – however, it’s best not to have the silica gel beads directly touch the seeds, so make sure to separate them. A solid way to obtain great marijuana seeds is to find a reputable seed bank. YourSeedCompany prides themselves on their germination and storage skills to make sure that their customers receive precisely what has been advertised. They have reputations to cater to, so delivering anything less would only harm their image.